The tactical battle of the biggest game for matchday 26 of the Bundesliga saw Lucien Favre of Gladbach victorious over Pep, in what is becoming one of the best tactical duels in the league. The Foals came very close to beating the league’s record for distance ran, which was also set by Favre’s well-organised team, running a collective total of 128km in comparison to Bayern’s 120km. It is now the second time that Bayern have succumbed to a team focused on strong compaction in the Rückrunde after losing to Wolfsburg in January, who were set up with comparable features to Favre’s system yesterday. For the home side, they featured in a 4-3-3 formation, which utilised an interesting midfield of Alonso being a lone pivot with movements from Alaba and Schweinsteiger both into the 6 space but also wide and, in the Austrian’s case, ahead between the lines too. This is the same trio which started centrally in their loss against Wolfsburg, where they also had issues in the centre of the pitch. The attack consisted of another trio in Gotze, Lewandowski and Robben who was to be forced off with injury and replaced by Muller in the 23rd minute. Neuer had an uncharacteristic game behind a defence of Bernat, Badstuber, Boateng and Rafinha. In particular, the partnership of Schweinsteiger and Alonso is problematic for the functioning of Guardiola’s midfield, as highlighted by SV writer Rene Maric in his German analysis. 1. Schweinsteiger and Alonso play in the same roles, with similar benefits and spaces used, whilst perhaps more importantly, require little variation in the opposition’s approach to counteracting such players. Because of this, you could consider the partnership redundant, as one of the two could perform the role to a similar effect that the two of them together make. Fielding a ‘redundant’ player is particularly harmful to Guardiola’s Juego De Posicion, which is quite dominated by the strategy of creating numerical advantages, which is obviously more difficult if two players are performing one role. 2. If the players do vary their roles, in which one player moves onto the next line whilst the other stays in the 6 room, neither player is accustomed to playing a higher position. 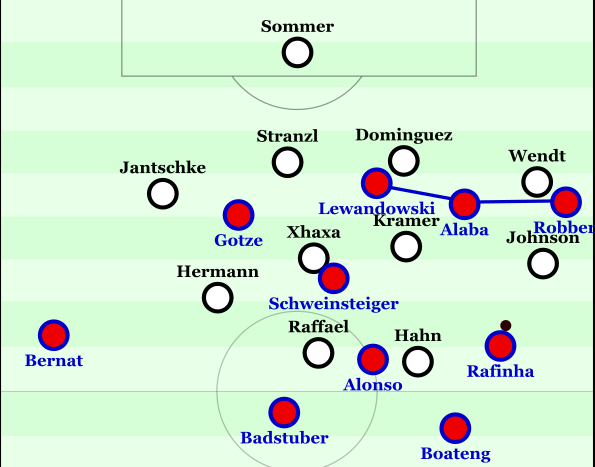 As shown in this match, as well as most others, Schweinsteiger occupies a higher position than Alonso in a double 6, as the German has slightly better ability in more advanced positions whilst also having a superior athletic ability. However, in these situations Schweinsteiger lacks his main strengths which are used in deeper spaces, and he can be crowded out fairly easily by an opposition horizontally compact with a central focus as shown in the diagram. When advanced, Schweinsteiger is surrounded easily by opposition players and thus has little impact. 3. It leads to lacking them a needle player which is vital in breaking down compact low-blocks. As previously mentioned, the two players in very similar roles leads to a lacking of a player in alternative spaces, which has an impact perhaps mainly, in the Bavarian chance creation phase of play. Without the needle player, they lack the ability to retain the ball in tight spaces with a missing presence to support combinations. 4. In defensive aspects, there is a poor distribution of roles during situations of midfield pressing. MR suggests that in a double 6 partnership, there is a ‘hunter’ and a ‘collector’ when it comes to pressing. As quite easily shown by the names, the hunter is the main presser and advances to support the higher players whilst the collector stays deep and looks to reduce the opposition’s ability to utilise any space left by the higher 6, whilst intercepting any vertical passes in reaction to the pressing. However when Alonso and Schweinsteiger are the pivots, the distribution of the roles is quite unbalanced, whilst Alonso lacks the athletic ability so meet the demands of pressing at times. Favre lined up in his usual compact 4-4-2-(0) formation, where the impressive Yann Sommer started as goalkeeper. A centre-back pairing of Dominguez and Stranzl were flanked by full-backs Jantschke and Wendt, whilst Kramer and Grant Xhaxa protected the back four exceptionally. Hermann and Johnson were positioned on the flanks and were crucial in Gladbach’s control of the centre and half spaces of the pitch, whilst Raffael and Andre Hahn were the two forwards, although the Brazilian in particular made frequent movements deeper. Favre’s side had a fixation on maintaining a control over the centre and half spaces against the ball, which proved to be absolutely vital in the outcome of the game. This is quite standard for the German side, as central control either with or without the ball is paramount to success on the pitch, as the centre is the most important area on the pitch. The effect of a control of the centre is comparable to chess, where if a player has key pieces occupying the middle four squares, he has positional dominance as he maximises the space which the pieces can access within one move, allowing the player to control as much of the board as possible. Thus by maintaining an all-round compact 4-4-2-0 shape in the centre (with wide players positioned in the half spaces), Favre could control the area of the pitch vital to Guardiola, and restrict the Bavarian access into here. Their pressing was also impressive, with situational pressure on the centre-backs and at times all the way to Neuer, without and issue of space behind being exploited as a result of their compact and organised defence. In Bayern’s construction phase with the ball at the centre-backs, Raffael and Hahn were usually situated on the same line as Alonso if he didn’t drop, or in the cases where he did, the same line of Schweinsteiger and Alaba. This immediately restricted Bayern’s passing into the midfield line and instead, they were more often building through the full-backs in a much weaker area, where Gladbach could easily shift across to suffocate any space there too. Gladbach’s compactness allowing central control, stopping any passing into the midfield from the 3-chain of Badstu, Alonso and Boateng. The only free players were the full-backs most of the time. The team pressing also had great flexibility and versatility due to the supporting movements from Hermann and Johnson, who frequently came inside to stop central overloads, and allow higher pressing. Although this left the full-backs free, they were happy to make this sacrifice as they had a much more important role against Schweinsteiger and Alaba (and Gotze frequently). 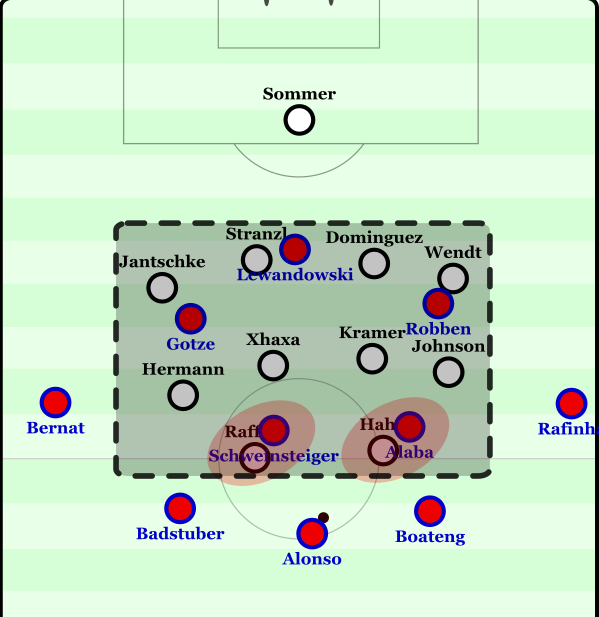 An example of this can be seen in the 8th minute, where Hermann’s movement inside onto Schweinsteiger (CM) allows Kramer forward onto Alonso, supporting the front two and forcing Bayern into a pass to a wide position, where they are much weaker and could potentially be isolated with the man-marking in the space nearby. Gladbach’s flexible pressing. The right-side of Gladbach’s defense was temporarily unsupported but because of the intelligent pressing, Bayern couldn’t access it and were instead forced in the opposite direction. 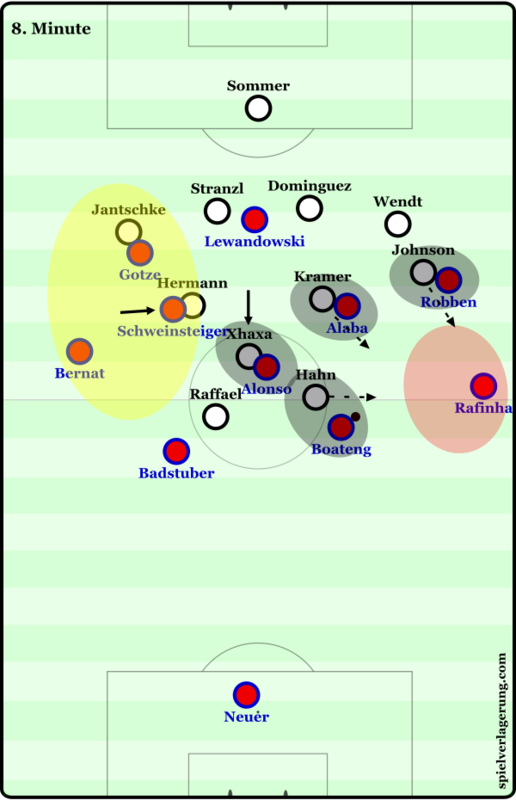 With their compact structure in wide areas, they did particularly well at stopping wide overloads being formed by the Bayern players, as they often attempt to penetrate the same-side half space by using the striker to occupy the near centre-back, whilst the winger stays on the touchline to force the full-back wide. This then opens up the half space for an 8 to push higher into, looking to receive a vertical pass in the newly opened lane to penetrate the defensive block. If BMG were an English team. However, with Gladbach’s excellently compact defensive block, they worked well against this. When the ball was wide, the shape was very ball-oriented and they shifted well, with the near CM in the half space to stop such plays. the whole midfield shifts to maintain a balance in the centre of the pitch, as shown below. … Thankfully they aren’t. Kramer in the half space stops Alaba from utilising the half space, whilst the near forward presses against the switch and keeps the ball out wide. Surprisingly, Guardiola had no answer to Favre’s Gladbach. His team in general were very focused on attacking through crosses into the box, which were completely futile with Sommer dealing with them comfortably. 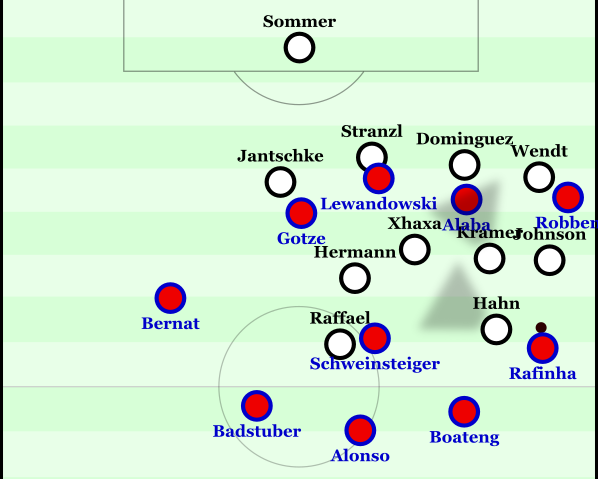 This was largely down to their lack of presence centrally, where aside from Gotze situationally, and Alaba when he moved higher, Bayern had no ability to play through. This can be contributed at least partially down to the combination of Schweinsteiger and Alonso, as previously stated their partnership hinders Bayern later in possession. Initially they were quite oriented to playing down the right side, through Robben and Rafinha with support from Alaba and Boateng (RCB). In these moments, Gotze would also come across as a situational 10. Arjen Robben was in great form in the build-up to this game, so this approach was likely to utilise his excellent abilities. However, after Robben left the field just before the 25 minute mark, they changed their approach slightly and were more variable in the spaces that they attacked. In their chance creation, there was a lack of combination play which would have been important in breaking down the opponents. This is considerably a result of their lack of players between the Gladbach lines, which is a testament to Favre but also a criticism of Guardiola’s plan for this game. During the potential combinations, they lacked the support to build from these plays in the initial stages of the combination and they resulted in very little benefit. Specifically I feel Gotze could have been integrated better for these situations, as he didn’t make a great impact on the game between the lines before being substituted in the 69th minute. Although credit must obviously be given to Gladbach, Bayern made little attempt to penetrate their defensive block, as shown by the lack of players between the lines which is very much unlike a side managed by Guardiola. As I’ve stated, they seemed much too content to play into the wide areas and then make ineffective crosses from there. With an extra player advanced (in replacement of the Alonso/Schweinsteiger duo) alongside Alaba, along with Gotze’s involvement whilst Lewandowski was making infrequent movements off of the defensive line, Bayern could’ve broken through Gladbach’s system more often than they did do in the end. That being said, when the midfield was breached, Bayern’s players had minimal time on the ball given the intense pressure. In general, crossing strategies are extremely inefficient, as chances are rarely created from such passes (in proportion to the amounts made per game) whilst the conversion is also poor. Not only were Bayern forced to attack through this means to some extent, but they seemed to be searching for these situations too, lacking the patience necessary to create better chances in central areas and crossing early during possession. The game proved to be a good display of a tactical battle between two great coaches. Favre did well to prevail against Pep, as his Gladbach side’s system worked perfectly as they restricted any useful space, making Bayern resort to inefficient crossing. Maybe the home team could have made a better attempt to penetrate Gladbach’s shape instead of submitting to defeat on those terms and playing towards the touchlines, however Gladbach closed out any space between the lines with a great intensity so Bayern would still have done well to break through the middle. How did Gladbach attack? What was their strategy when they had the ball? Would love to see a bit more insight into that. Given their lack of possession, it was largely in transition through Raffael and Hahn. Their ExpG for the 4 shots they had was 0.5, so there was an element of luck in their attacking and ultimately their two goals, what with Neuer’s mistake etc. There were also a few cases of balls over the top looking to exploit Bayern lacking defensive insurance in the defensive line as Boateng pushed forward, especially in the second half. Wolfsburg did similar and scored at least one goal from this if I remember correctly. Overall it’s quite difficult to analyse into great detail though because their attacks were so infrequent. But what about the substitutions? Could you elaborate on the question please? Pep could’ve definitely restructured the wide attacks better, and it surprised me that he didn’t, given his nature. The bundesliga seems to show some of the best defensive tactics in football, not simply dropping back but actually taking control of the pitch without the ball. Defending is almost as much an art as attacking and it’s great to see a team that shows such good understanding of it. Yeah, Favre is an absolute master in this regard. And the best thing: The counter attacks from this shape are as designed as the defensive shape is. Wonderful to watch. Germany seems to have a large group of very interesting managers. I hope some of them attempt to leave their confort zone and at least try to coach outside of the country. PL managers are too afraid (or maybe they’re simply not good enough) to take charge of an european club. great article, keep up this fantastic site and work you guys do, it is very interesting indeed. Their performance out of possession was one of the best of the season, definitely. Going forward, their shots registered an ExpG of 0.5, so they should’ve scored 0.5 goals on average with the efforts they made. You’ve gotta credit luck partially, given the Neuer mistake but you can’t say they weren’t efficient!